The Texas Controlled Substance Act makes no differentiation between samples and medicine ordered from a drug wholesaler or pharmacy. 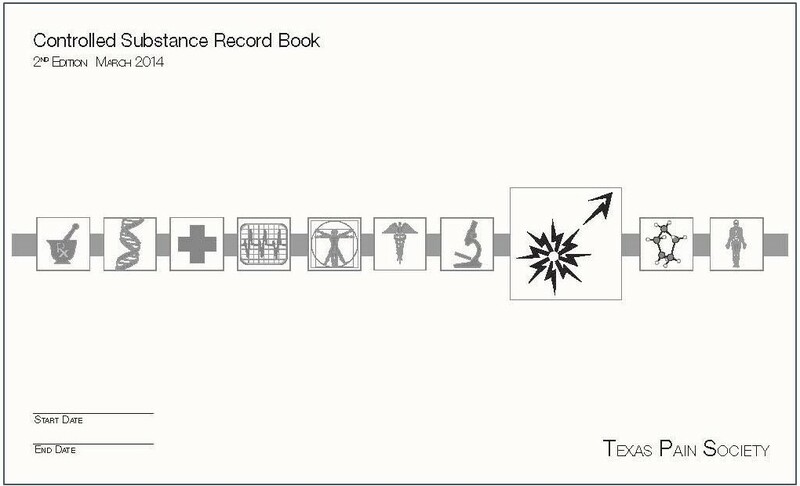 ALL controlled substances must be accounted for in a log book (numbered and bound) in addition to entries in the patient’s medical chart. View more information on the Act. Order Online Now! OR Download Order Form and mail in. Texas Pain Society has created a white paper for recommendations and best practices for using the Texas Prescription Monitoring Program. Texas has had the Texas Prescription Program (TPP) to monitor CIIs since 1982 and in 2008 started monitoring CIII‐V, but today physicians have easier accessibility to the monitoring program through PAT II, where they can login to the TPP via a website. In September 2011 a company, Optimum, received the contract for hosting and collecting the data for the TPP. Previously the hosting, development and data collection was done internally by Department of Public Safety (DPS). DPS had developed a website accessible version of the TPP (referred to as PAT I – Prescription Access in Texas) which went through several rounds of beta testing that began in August of 2011, while the traditional fax request method was still in place for the non beta testers. Texas Pain Society has made a major accomplishment in the continuing fight against prescription drug abuse and the illegal practice of pain medicine. In January of this year the TPS Board of Directors voted unanimously to draft a resolution to submit to the Texas Medical Association (TMA) to identify the legitimate practice of pain medicine and help educate all physicians about the current abuse and misuse of opioid analgesia management. TPS Board members Drs. Graves Owen, Larry Driver, and C.M. Schade drafted the resolution. The precise role of urine drug testing (UDT) in the practice of pain medicine is currently being defined. Confusion exists as to best practices, and even to what constitutes standard of care. A member survey by our state pain society revealed variability in practice and a lack of consensus. The authors sought to further clarify the importance of routine UDT as an important part of an overall treatment plan that includes chronic opioid prescribing. Further, we wish to clarify best practices based on consensus and data where available. The United States currently has a prescription drug abuse epidemic (1). The unintentional lethal prescription overdoses (OD) has increased in proportion to opioid prescribing patterns (2). Opioids are the primary drug resulting in these preventable deaths. For each unintentional lethal prescription OD, 9 people are admitted for substance abuse treatment, 35 visit the emergency department, 161 people report drug abuse or dependency, and 461 individuals report non-medical use of opioid analgesics (1). Among the victims of lethal prescription OD, the rural and more impoverished counties, Medicaid populations, and mental illness are over represented (1, 2). Deaths from opioid prescriptions now exceeds deaths from cocaine and heroin combined (fig 1).